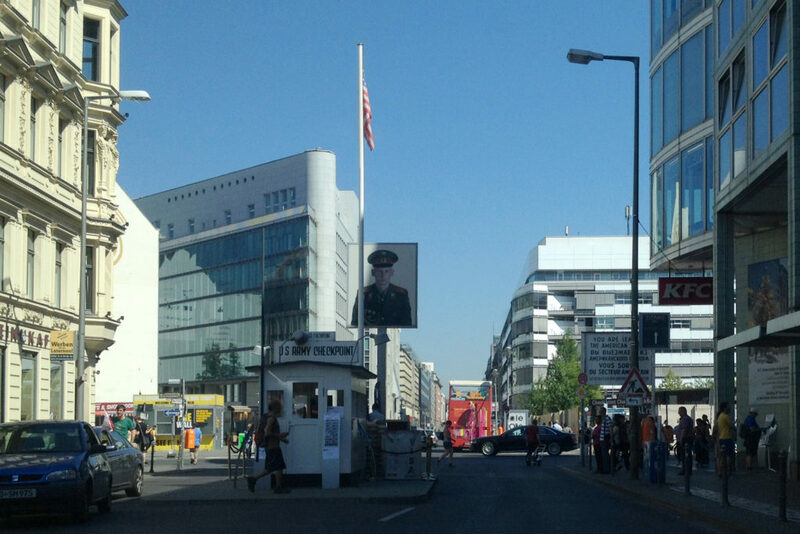 A visit to Checkpoint Charlie is a bit like a time travel. There are only few sights in Berlin that are still in the original shape they were during the Berlin Wall Era – only few details left of Cold War Berlin. Checkpoint Charlie is kind of one of them. Of course most of the border installations are gone – but there is still the little booth in the middle of the street (Friedrichstrasse) that actually was part of the Berlin Wall border installations. Since this part of Berlin (Kreuzberg) was part of the American Sector, the booth you can see in the picture above used to belong to the American Army. This was the place, where you had to show your passport in case you wanted to cross the border between West and East Berlin. Checkpoint Charlie was one of series of different checkpoints between East and West, some of them named after the “Army Alphabet”: Checkpoint Alpha was located near Marienborn/Helmstedt at the border between East and West Germany – one of the checkpoints you could use when you wanted to travel from West Germany to West Berlin. Checkpoint Bravo was located at Berlin-Zehlendorf/Dreilinden – basically the other checkpoint you had to cross once you decided for Checkpoint Alpha. Checkpoint Charlie was then the third allied Checkpoint. I guess it’s worth mentioning that the West Allies did not really check on regular people – only military personal and officials had to show their papers – their credentials.